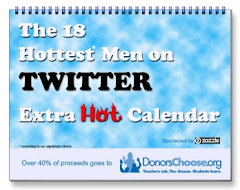 A couple of months ago, at the behest of Dave Delaney, a group of 18 manly men of Twitter left our pride (and in a few cases, much of our clothing) at the door and volunteered our photos for a fund-raising calendar, "The 18 Hottest Men On Twitter." While we had fun taking the photos, and blogged and tweeted about it when it first became available, very few of you responded, judging from the somewhat lackluster initial sales. When us self-proclaimed "HotMen" debriefed ourselves and questioned our poor results, it quickly became apparent that this was not about us, it was about THE CAUSE, and despite our desire to do some good, perhaps we had lost sight of that in favor of giggling at our goofy pictures. Dave is a Dad (as am I and a number of the "dudes" in the calendar - in fact, a number of us also write for "daddy blogs" such as Dad-O-Matic and Digital Dads). As parents we know that one of the most important things in our society is the education of our children. Few things, if any, are as important. Donors Choose is "an online charity connecting you to a classroom in need." It is a unique, interactive charity where public school teachers from across the country can post classroom project requests, and donors can browse or search the requests, and choose the specific project you want your donation to be applied toward. You can donate as little as $1.00 and still have the ability to decide exactly where that dollar will be spent. Even better, you can follow the progress of the project once necessary funds have been raised and know firsthand that your support has been received, applied and appreciated. Thanks to our partners at Zazzle more than 40% of the proceeds from the sales of the Calendar will go directly to Donors Choose. PLEASE BUY 1 or 10 TO SUPPORT DONORS CHOOSE. And frankly, if you can't bear the thought of staring at one of us geeks for each of the next 18 months (yes, it is an 18 month calendar!) then skip the calendar part and just go make a donation at www.donorschoose.org. After all, it's not about the Calendar, it is about the cause!!! At the beginning it seemed like things were on track. There were 18 apps in the catalog at launch, and within a matter of days it grew to 30 apps. Then, NOTHING. For weeks and weeks and weeks the app reservoir has been dry. Barren. APPallingly inactive. All things considered, if the Palm team were aware that the population was going to be limited only 30 apps for the foreseeable future, I think they would have been much better served by doling them out two or three a week until they were ready to open the app floodgates. Even if the total number of apps remained small I think the Pre would have maintained much more continuous momentum, and the related "buzz" and sales demand, if there had been a constant flow of new apps emerging in the catalog. LIKE CARLY SIMON SAYS... ANTICIPATION! Yes, buzz and demand can be created by anticipation... to a point. However, after too long a wait I believe the risk is that anticipation unfulfilled leads to frustration, or even worse, boredom, and then ultimately a lack of interest. With constant competition from the iPhone, new Blackberries, and a new Android Hero, Palm should be doing everything in its power to maintain the excitement and momentum that a steady stocking of apps would bring. What do you think? Is a slow steady rise more effective than a big quick launch followed by a flat line? 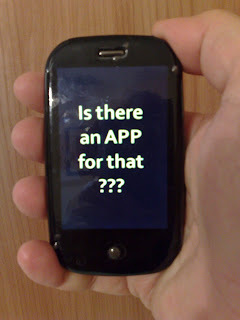 How would you have handled the thin initial supply of apps if the Pre were your product? Have you had similar experiences or challenges with other product launches?